Blackpink Concert in Jakarta 2019: How to Exchange the E-Voucher to Ticket? Hello, Blink! You must be so excited to watch the amazing performance of Jennie, Jisoo, Rose, and Lisa at Blackpink 2019 World Tour in Your Area Jakarta. How was your experience while buying the tickets online via tiket.com? Well, even though the e-voucher is already in your hand, you still have to know how to exchange the e-voucher to the ticket for entering the concert area. For you sobat tiket or Blink who want to know about the e-voucher exchange requirement, read this simple guideline below to get all the information you need before watching the Blackpink concert in Jakarta 2019. When you successfully buy the concert ticket of Blackpink at tiket.com, you should get e-voucher and invoice as the proof of your online transaction. You need to exchange this e-voucher to an official ticket to enter the venue. Print your e-voucher and bring it to the exchange location. The barcode on the voucher will be scanned by the concert organizer. Check the location and the timing of ticket exchange below. Date & time: 16-18 January 2019 at 11.00-17.00 WIB. Date & time: 19-20 January 2019 start at 10.00 WIB. Okay, now you already know about the schedule to exchange the Blackpink tickets. Do not forget to bring your printed e-voucher to the location informed above and let’s move to the second requirement. Do not forget to bring your valid ID Card while exchanging the e-voucher of Blackpink concert in Jakarta 2019. Show your own ID card to the concert organizer at the location. If you purchase the ticket with a credit card, bring the credit card or the copy of credit card. 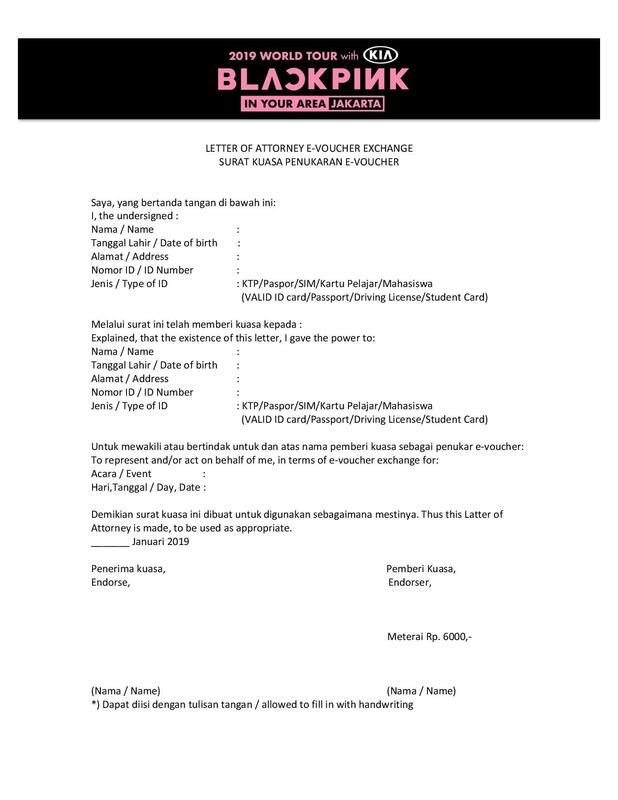 You could represent someone else to exchange their ticket, but you should bring a Letter of Attorney that has been signed and stamped with Materai Rp6000 by the person. The template of the Letter of Attorney can be downloaded here. Also, do not forget to bring the copy of the person’s ID card and the copy of credit card if they purchase the ticket with CC. The barcode on your e-voucher will be scanned if the data you show has been completed. After the barcode scanning process, you will get the entrance ticket of the Blackpink concert in Jakarta 2019. Do not upload or share the barcode or photo of ticket barcode on social media or other places. This is absolutely important to prevent your ticket barcode to be stolen by someone. Save the ticket carefully to prevent damage. The organizer can prohibit the ticket purchaser to enter the venue if they do not bring the entrance ticket. Before watching the concert, please make sure that you have prepared other needs including transportation and hotel as the accommodation, especially if you come from outside Jakarta. Check the hotel near ICE BSD if you want to spend a night in Tangerang Selatan on the day of the concert. Open your tiket.com app any time you want to buy flight tickets, train tickets, car rentals, or hotels. So, are you ready to meet Blackpink? See you at the concert, Blink! Previous article Butuh Sewa Mobil? Perhatikan Dulu 5 Hal Ini.